This is a project I finished some time ago. 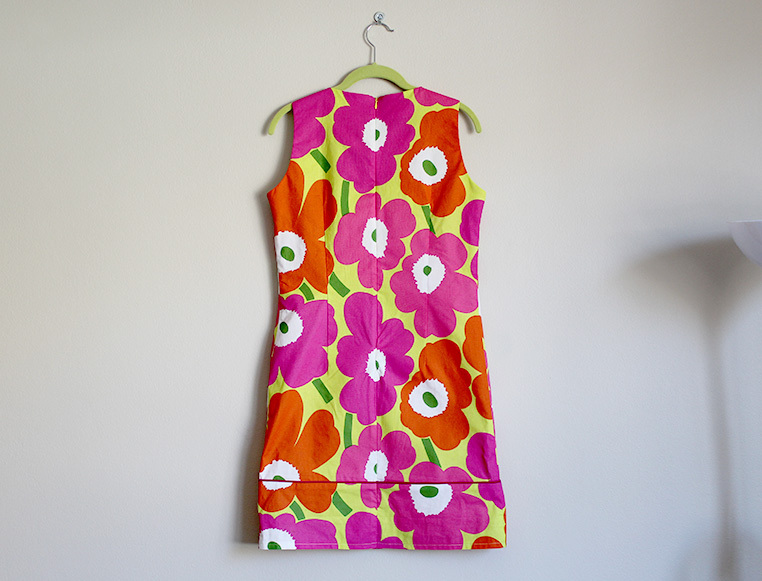 One thing you must know about me is The Marimekko Unikko print is my favorite print of all time! When my mum gave me this textile I was overjoyed- however my plan to go ahead and use my favorite fabric (rather than leaving it hiding in the stash forever) almost backfired with this project- more on that later! 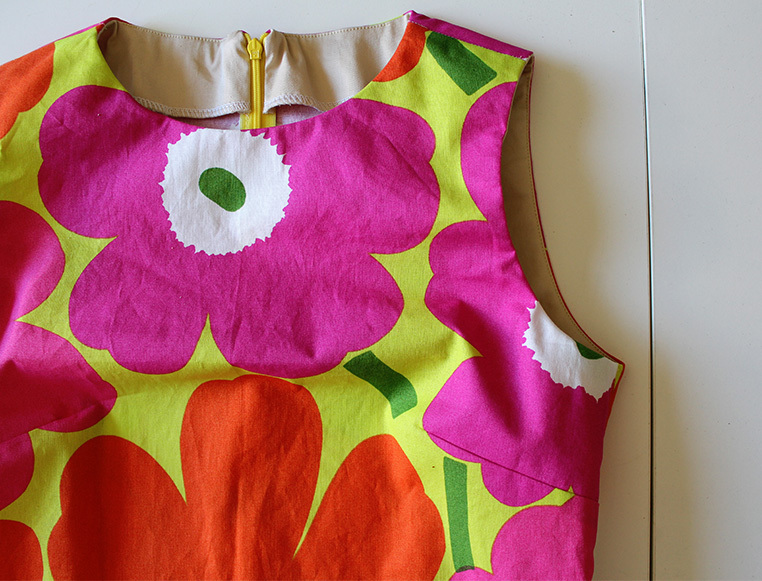 A bit of history regarding the print: the Unikko/poppy print: it was designed in 1964 by Maija isola, as part of a collection of floral prints, after Armi Ratia (the company’s founder) had announced that Marimekko would never print a floral pattern. Thank god for Maija’s little act of creative rebellion! The colour-way I have here is pretty rare (orange, pink and lime green -wow. I just LOVE it!). Though it’s impossible for me to put into words why/how much I love this print- I think it captures a lot of what I like so much about the 60s. It’s bold youthful and optimistic and there is this delightful naivety to how the poppies are rendered *sigh* so beautiful. I felt that the last time I used this pattern it was a smidgen too tight and I wanted a relaxed fit (so I sewed with 1cm rather than 1.5cm seam allowance)- Anyway because the dress was so boxy I felt as though I had to shorten the dress A LOT to make it work. I must have been in a crazy state of mind because I cut WAY to much off the hem, putting it into tunic territory. Lets just say I was pretty distraught! 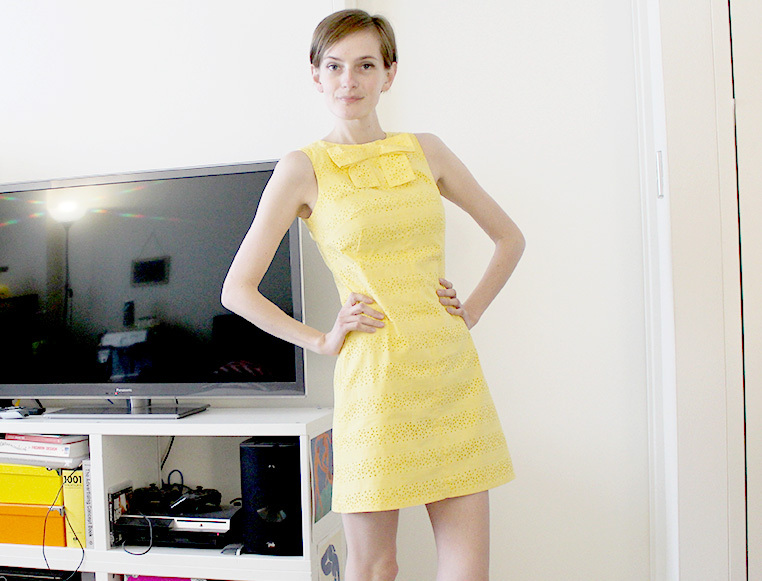 I had just cut a dress made in my most favorite fabric too short! If you have ever been in a car crash you may know that feeling you get when something bad/shocking happens- it’s almost as if you detach emotionally and watch it all unfold in shock and disbelief, as if its happening to someone else. Sorry to be melodramatic but that’s sort of how I felt when I cut the dress too short! Luckily the part I cut off was still intact and connected at the side seams. I took time deciding what to do. Got some great suggestions from my friends on instagram and ultimately I decided I would re-attach the part I cut off and add some piping in between, in order to make the seam look intentional. Lincraft had a surprisingly good selection of piping. I bought 2 meters in a couple of different colours and ultimately went with this pink velvet piping. Clearly there is a lot of fun to be had with Piping! It was my first time using it and it certainly wont be the last. OK I KNOW the middle flower doesn’t match up at the petal on one side, but I’m still going to file this project under ‘crisis averted’! You will notice I used a different fabric for the facings. This is the way to go when you only just have enough fabric for what you want to make. Plus this fabric is very precious. I am turning any remaining off-cuts into pouches and/or pencil cases! I quite like my bright yellow invisible zip. 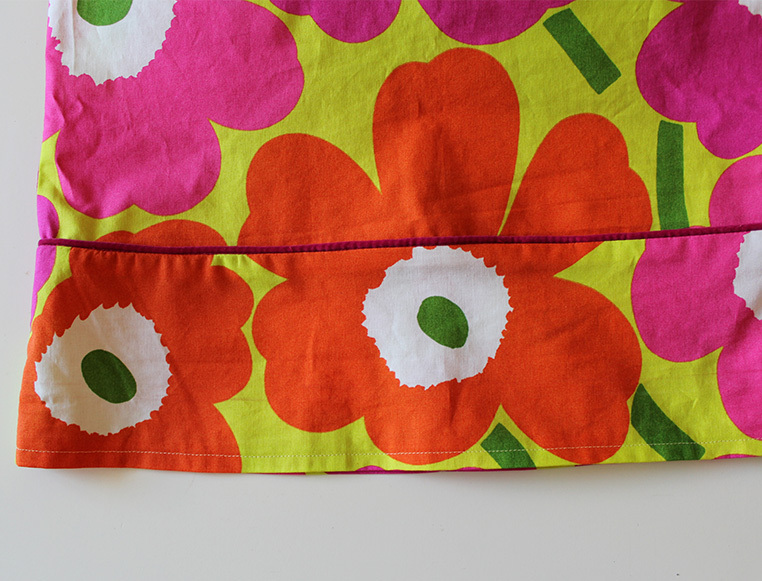 I’m not the kind that thinks invisible zippers always need to match your project exactly. 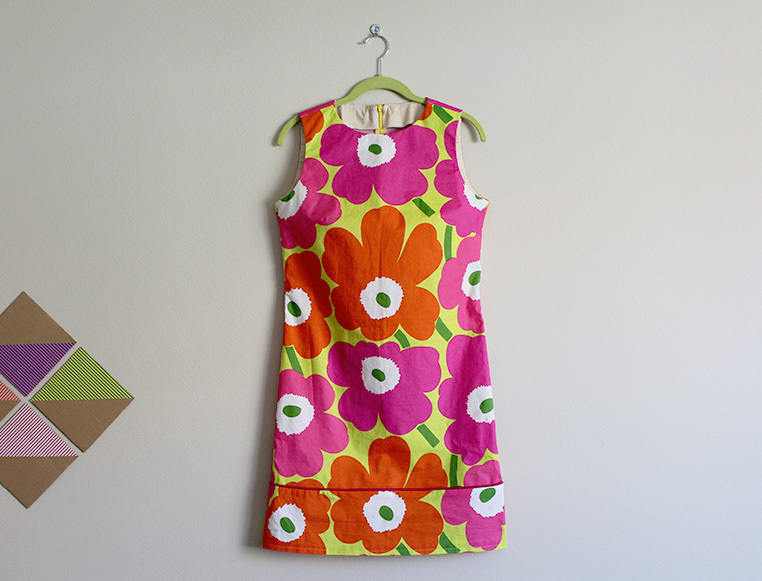 Perhaps I am a bit of a rebel too 😉 Happy 50th Unikko! My lack of activity in the blog-o-sphere really has been haunting me, I wont lie! I recently started a new job. Don’t think it’s right to discuss work on a blog but I will say that I am really excited and I hope I can do a good job :)! 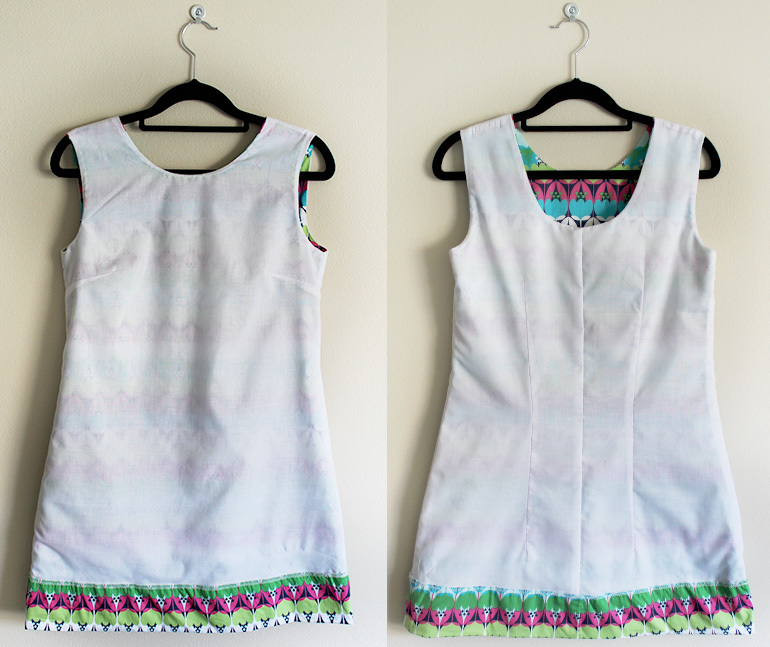 Yesterday I got in lots of sewing time in (housework be dammed) and today I made the final touches to this dress. I am not really stoked about the fit of this dress. I think I could have gone up a size or made the side seam allowances smaller. For anyone else who is considering making a dress up in the same pattern I would probably recommend going up a size if you don’t want a super tight fit. I have heard that vintage patterns are generally a smaller fit and this one has lots of darts and shaping. Recently I have gone up half a dress size, I’m happy about it, but it does make deciding what size to cut more complicated (I’m sure others can relate). A lot of people move between sizes at different stages, but you want to pick a size that will work over time, so yea perhaps it’s better I go for a slightly looser fit next time! The tricky thing about this faux cotton eyelet fabric is the ‘crease factor’. I am not really against a bit of creasing and I went to the trouble of underling the dress with a lightweight cotton which preserves modesty and makes the dress way more fancy! I really do love the effect underling has on a dress! It makes the dress fabric behave and it makes the dress feel much more substantial. I really recommend underling. If you want to try it, or just want to learn more Julia Bobbin has a great tutorial/info ! I do wonder if the yellow cotton material was the right choice for this style of dress! Despite the underling, it does pull and crease slightly (which is to be expected) but perhaps the fabric would have served me better as a top or a fuller pleated skirt. Doing something so fitted in a lightweight cotton may have been a bit silly. The bow was fun and not difficult to make. I feel like adding bows to all my projects now. Mmmm I’m a big fan of the bow 🙂 (though I don’t enjoy the hand sewing on it). I had those eyelet stripes going across the dress, which meant that I wanted them to match the fabric on both sides of the zip. I found a neat way of basting the other (yet-to-be-attached) side of the zip (keeping the regular sewing foot on and just moving the needle), before sewing the other side of the zip on….Guess that it’s too hard to explain without a tutorial. That’s probably enough about the dress. Hope you like it! I made a muslin using a different burda shift dress and it’s got me pretty excited excited about! 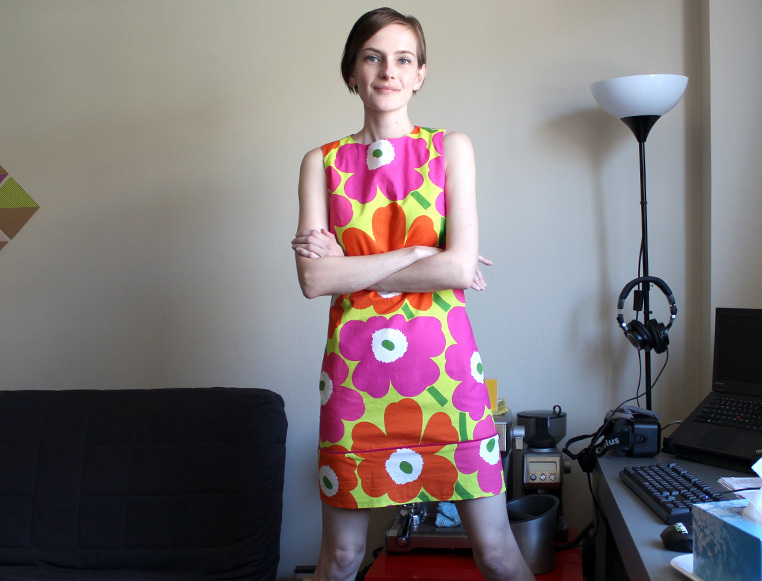 It’s a looser fit shift dress, totally basic design and it’s bra-friendly. 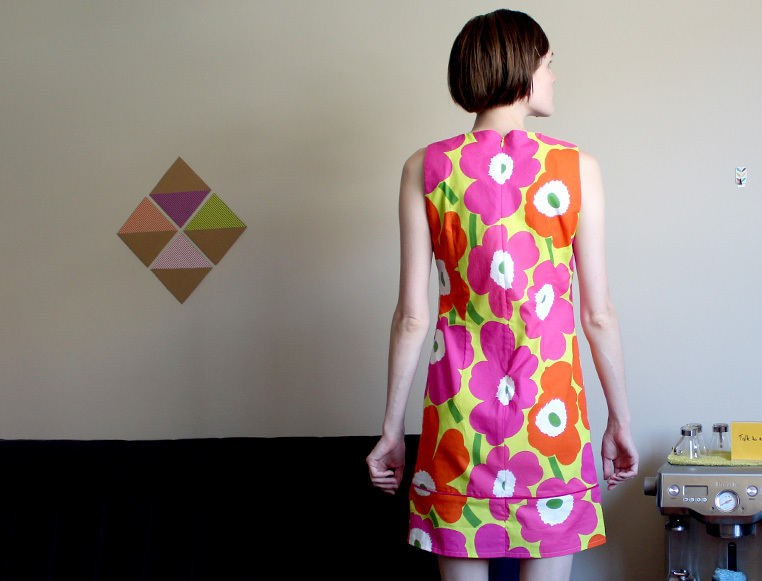 so I’m sure I will make a lot of dresses soon in crazy bold patterns! 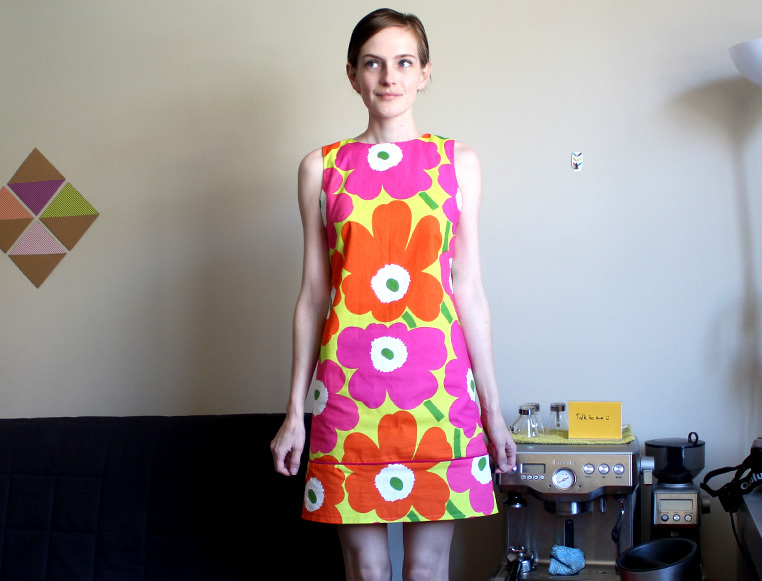 So for the past month or so I have found myself a little too hooked on pinning 60s fashion/style “sewing inspiration” (on pinterest)! 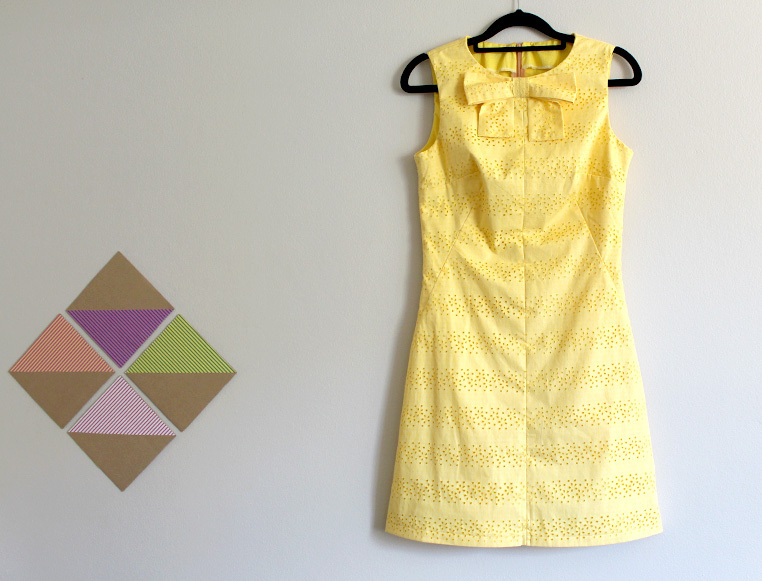 I decided that finding a shift dress pattern that was as simple as possible (A line, loose fit, just bust darts etc) was my no 1 sewing priority. 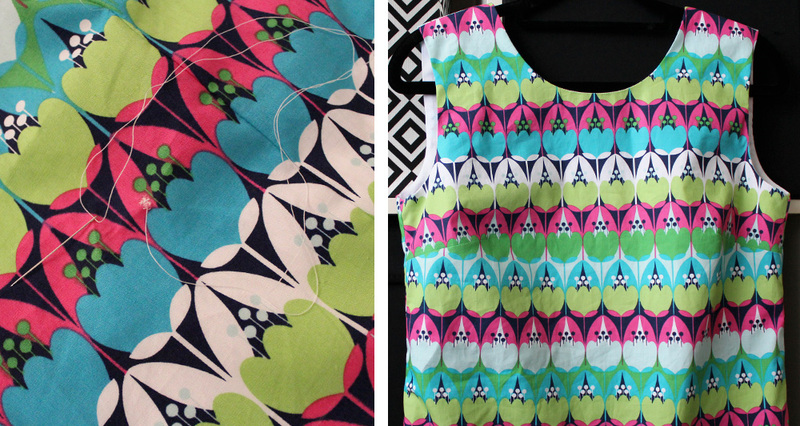 I absolutely adore bold prints, so I figured once I had found a simple shift dress pattern, I could finally make TONS of simple dresses in statement prints! Sorry if this is TMI-I wear short shorts under my mega short shifts-that way I don’t worry about flashing anyone or looking indecent. It’s just when the silhouette is very loose I seem to end up making my dress much shorter. When I studied fashion design many years ago (quit before the end of first year) and the subject I did best in was textile printing. I LOVED designing prints more than anything else! I still have some orange twill I printed with a geometric rubylith design from back then. When I find it i’ll make a dress out of it, because I think I’ve found the pattern to use for it! I bought this fabric from spotlight for a steal many years ago. Happily I still have more of it! The lining is just cheap poly cotton. Gutterman thread of course! Heres a link to the pattern I used. I got mine from a burdastyle magazine (3/2010 style 104). The dress is actually a “wedding dress” go figure…then again if I did get married (which I highly doubt), it would not be in a traditional wedding gown either! I have gone back to making a muslin/test-garment before I make a dress. In this case it worked out well! 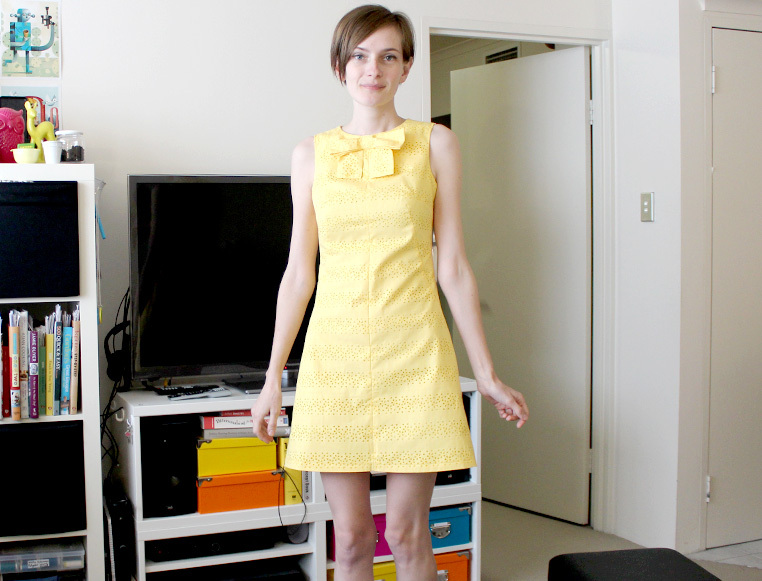 I only made one test garment, Luckily I didn’t overfit this time, as this dress is supposed to be loose. If I make it again I think I will let out the shoulder seams and possibly the top of the side seams as it is a smidge too tight there. 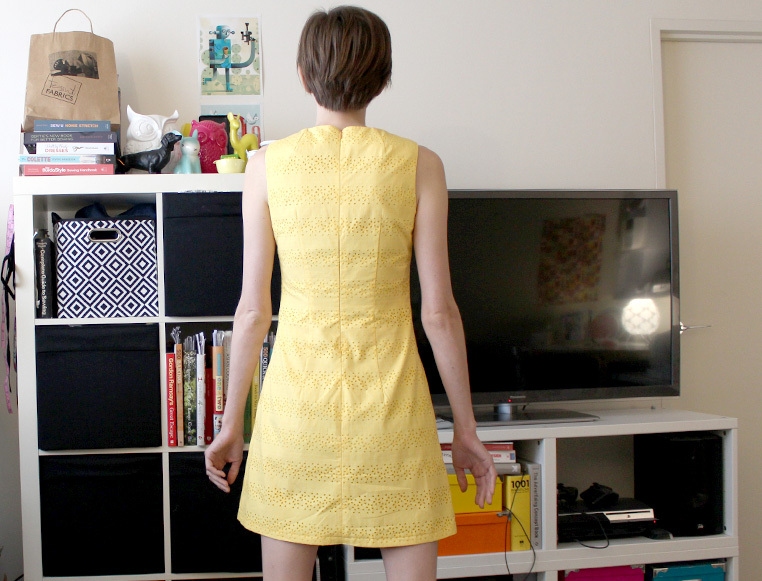 I cut out the pattern in the smallest size size 10 (a europen 36) I took it in slightly on the side seams, lowered the neckline a little, altered the shoulders and added small darts to the back (for just a bit a bit of shaping). I was so in love with camelias and crinoline’s version of this dress! She mentioned she cut the back of the dress lower- eliminating the need for any fastenings on this dress. I did this too and it turned out to be a BRILLIANT idea! I love a dress you can just slip over your head! I decided to avoid facings or bias binding. 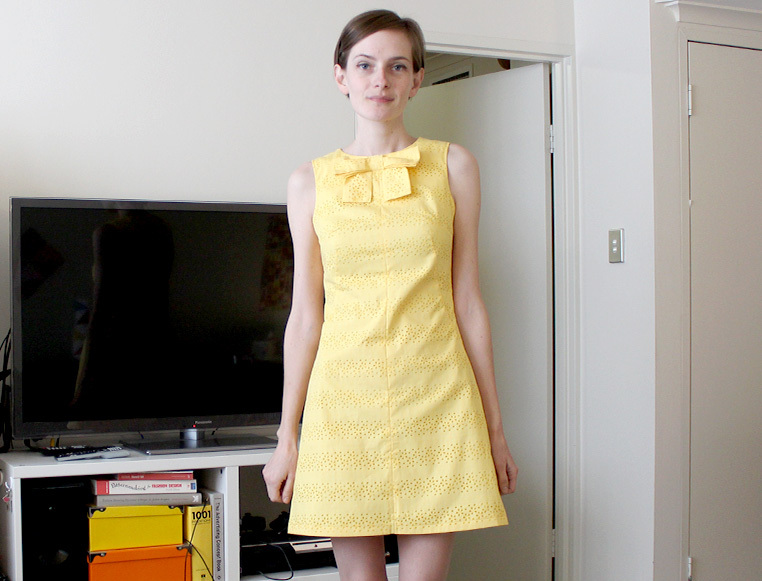 I fully lined the dress, with no hand sewing! I used the same technique that I have used for bodices, when I made a lot of fit and flare style dresses and it worked a treat! 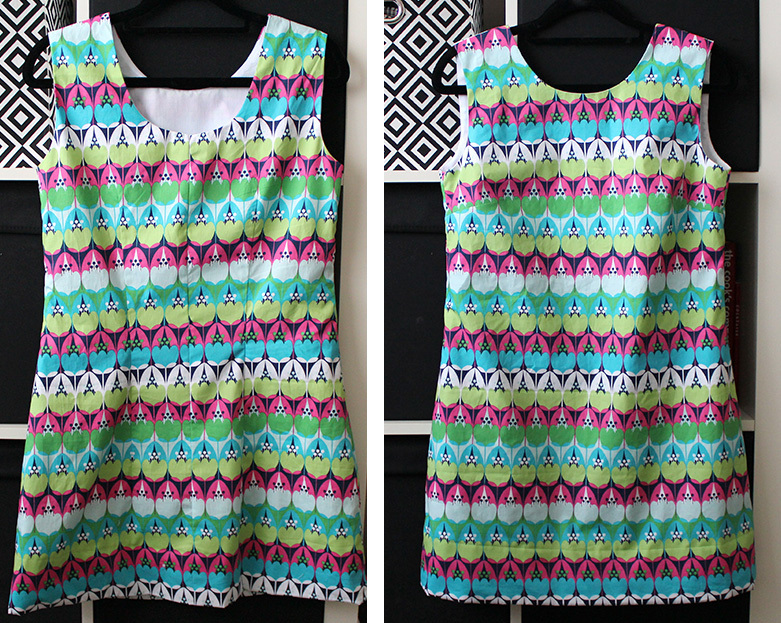 Would anyone be interested in a tutorial on how to line a sleeveless shift dress completely by machine? You get a nice clean finish! 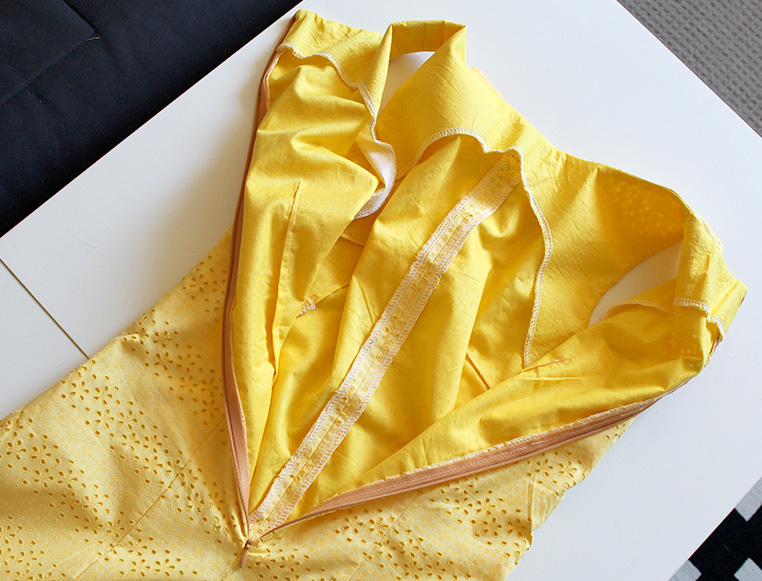 The lining helps to add weight to the dress, which also means it doesn’t crease as easily. While I was finishing the dress (about to hem it) and after 7+ hrs making it/lining it nicely, I noticed a little hole in the back of the dress! I was so bummed and at that point I couldn’t even be bothered changing the colour cotton I used, when repairing the hole! Moral of the story: Be careful with your clippers and always check for faults in your fabric! 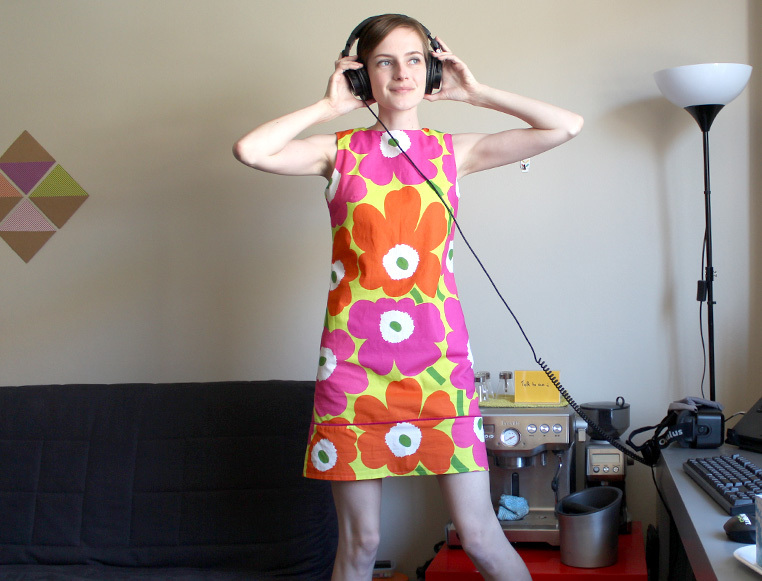 I did the biggest/widest hem of all time on this dress (its a long story). I used a blind hem foot to finish the hem. I actually like the treatment of the hem because it helps the dress stand out/hold it’s shape. No zip needed, I just love that!